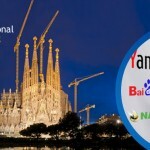 Want to grow your online presence in the increasingly lucrative Eastern European internet market? 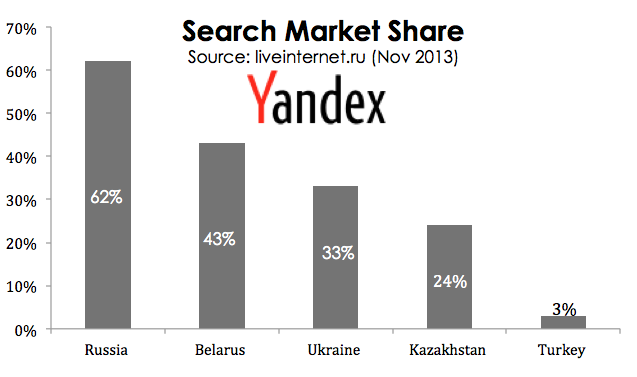 If the answer is yes, then you need to familiarise yourself with Yandex, Russia’s leading search engine. 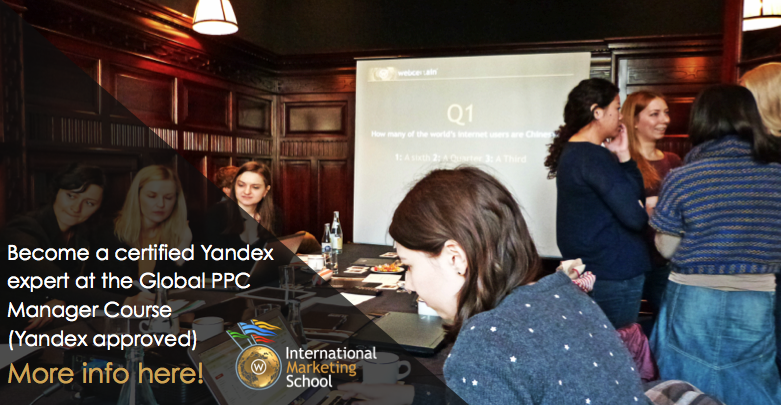 With a majority share in Russia (62%) as well as strong positions in Ukraine (43%), Belarus (33%) and Kazakhstan (24%), the fastest and most cost-effective way of getting your brand in front of this audience is to run PPC campaigns via the Yandex.Direct PPC platform. However, the land of the Matryoshka and the neighbouring countries have their own set of rules, and if you wish to be successful in those markets, you should add to your marketing dictionary terms like ad blocks, units and autofocus. The advertising model of Yandex.Direct is very similar to Google AdWords: your ads are displayed according to your bidding strategy and you get charged every time someone clicks on your ad. 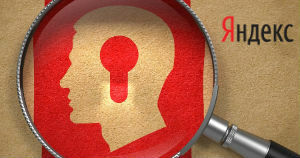 However, Yandex differs very much from Google when digging deeper into the details. If you wish to open a Yandex.Direct account, you have to set up a Yandex email. This takes just about 30 seconds to do, so that shouldn’t deter you from following through. Moreover, campaigns must be prepaid (the minimum amount is $8.50) before being set live. There are several payment methods available depending on where your company is based: US clients can top up their accounts via bank transfer, cheque or PayPal (which accepts credit cards); European clients can do it via bank transfer but must allow for one week before the start date of the campaign to make sure the payment clears. Yandex is currently working on introducing credit card payment options in this region too. Just as the other popular PPC platforms out there, Yandex’s account layout consists of campaigns, ad groups, ads and keywords. Ad groups were introduced towards the end of last year following requests from foreign advertisers. Thanks to this addition, there is now an option to A/B test the advertising message, which was not possible only a few months ago. Read more about the Yandex ad groups in my previous article here. If you’re thinking about copying your existing Google AdWords campaign into Yandex, think twice. The ad character limits are different (33 for the ad title and 75 for the ad description), however this is not nearly as big an obstacle as the keyword match types themselves. While the operators used for defining match types look the same as in Google (+, -, “” and ), each one of them narrows your audience in a different way to AdWords. 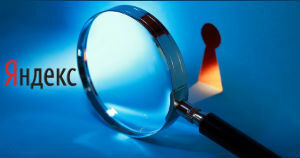 Learning those differences is very important for effective keyword targeting. 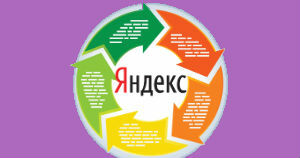 Up until the end of last year, all Yandex accounts operated in units. One unit was equivalent to $0.85 or €0.65 – and this was a fixed rate. All new advertisers will operate in the multi-currency interface, allowing them to choose the currency which they wish to see their campaign’s expenditure and average CPCs in. Current advertisers are gradually being moved to the multi-currency interface, which may take a few more months to complete. 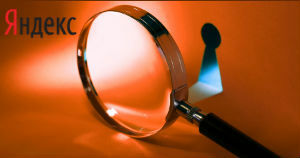 When setting up a new campaign, you have to specify a bidding strategy which you wish to apply. These can vary from manual strategies (require manual max. 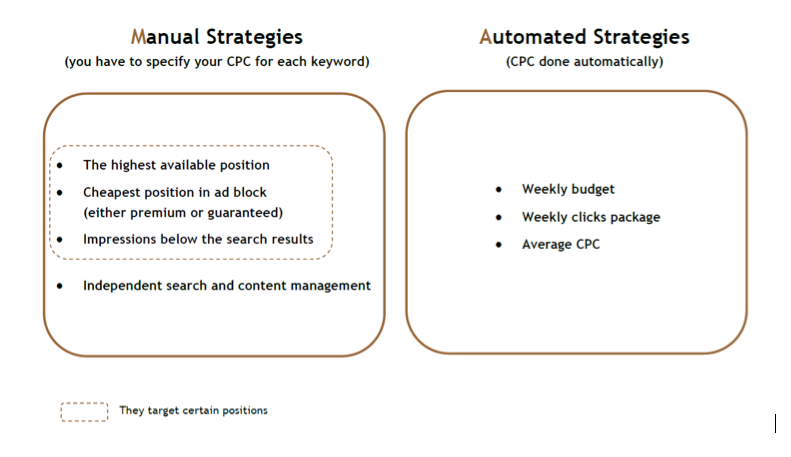 CPC adjustments for each keyword) and automated (you have to specify your target and Yandex will adjust your keywords’ max. CPC depending on your requirements). One of the most popular bidding strategies is weekly budget, which has an option to maximise clicks or conversions. Targeting conversions, however, is only an option available if you have Yandex Metrica installed (Yandex’s own analytics tool) and its tracking code called ‘counter’ placed on your website. At first glance the reporting system may look very complicated; however, once you familiarise yourself with the Yandex way of displaying data, you will notice that there is a good amount of detail that can be obtained from the platform regarding your campaign’s performance. This includes performance per each site, region, campaign, adgroup (new! ), ad position etc. Yandex.Direct does not offer conversion tracking unless you install the Yandex Metrica code on your website and specify goals. Luckily, this is a very easy and quick process. Once you have done this, three additional columns will appear in your Yandex.Direct account: page views (depth), conversion rate, and goal cost. Yandex.Direct does not offer search query reports in the same format and detail as Google does. However, if you enable the ‘Additional relevant impressions’ option, you can see this data in Excel format. Also, search queries are available via Yandex Metrica. This is one of my favourite options. 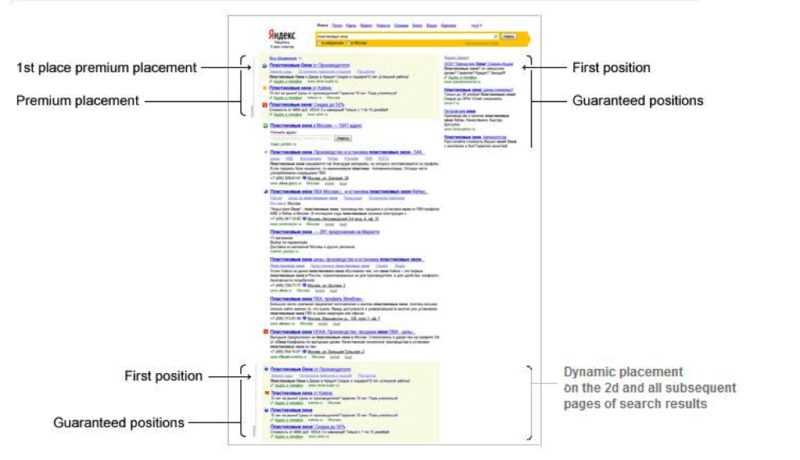 Yandex’s algorithm is clever enough to identify those search queries which did not result in a click and drove down your click-through rate (CTR). Based on this analysis, the system will propose certain negatives to be added on the keyword level to refine your targeting. Yandex offers negatives on the keyword level which would look something like this: ‘leather sofa –cheap –red’ . In addition, if you enable Autofocus, another clever tool, it will automatically refine your keywords by adding negatives to them and sending you an email or SMS every time it has done so. Brilliant time saver! This is located above the organic search results on the first page. Up to three ads can appear in this ad block and the first one is called ‘1st place premium placement’. This is located below the organic search results (or in some cases on the right hand side). It can display up to four ads and the first one is called ‘First position’. If your ads do not qualify for any of those blocks, they will be displayed below the organic search results on the second page in the block called ‘Dynamic ads’ or on the Yandex Advertising Network, which a Google AdWords user would call ‘display network’. The ad position report includes only two options: ‘premium placement’ and ‘other placements’. The latter metric will therefore display data for both guaranteed and dynamic positions. While Yandex.Direct is a platform with similar principles to Google AdWords, various aspects differ – as outlined in this article. And getting to grips with these differences is essential for making the most of your Yandex PPC efforts. Justyna is the Director of Learning and Development at Webcertain and Certified Yandex Expert & Master Trainer. She has over 5 years' experience in managing international and multilingual advertising campaigns from a variety of industries including B2B, e-commerce and non-profit sectors. She is the official Yandex Expert and Master trainer, who over the last 3 years has trained hundreds of marketing professionals from globally recognised brands such as Adidas, booking.com, SAP and Airbnb on how to run effective international campaigns. She has spoken at digital marketing conferences across the world and is a certified Yandex, Google AdWords and Bing PPC specialist. Justyna is originally from Poland and currently lives in the UK. 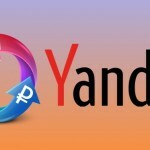 Pingback: Yandex PPC – How To Have It Managed For Free!